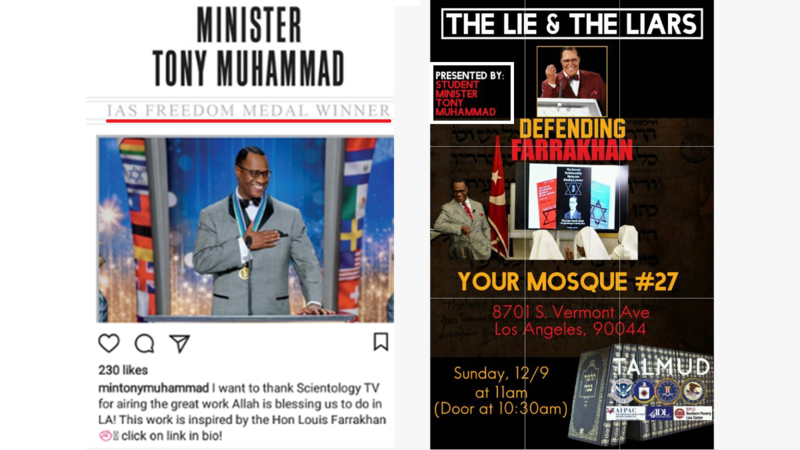 Sunday, 12/2/18: Facebook Live lecture by Scientology Freedom Medal Winner Nation of Islam Minister Tony Muhammad. 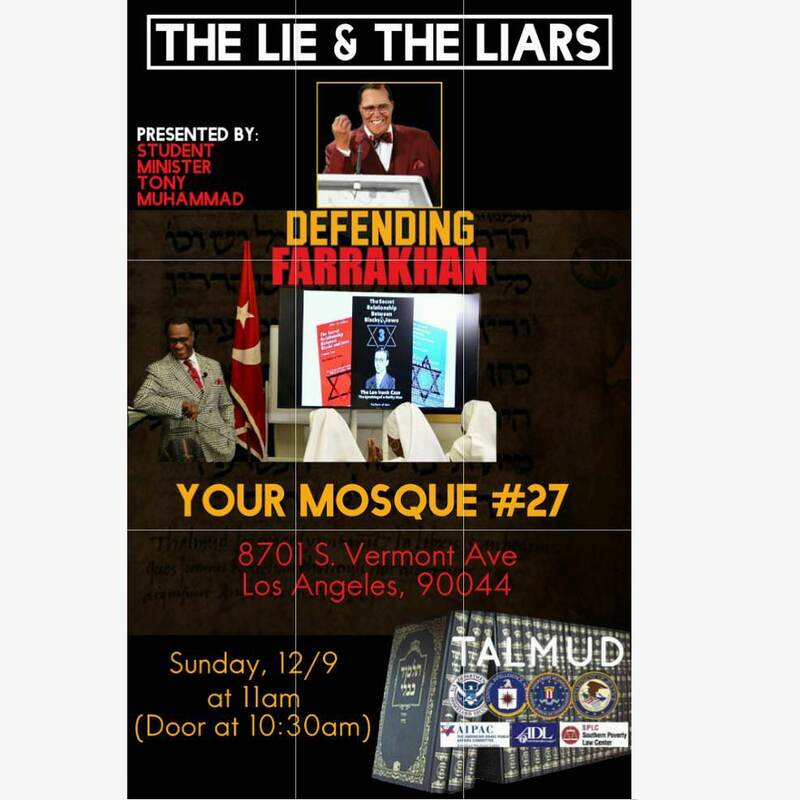 Yesterday, Sunday, December 2, 2018, Scientology Freedom Medal Winner Nation of Islam Minister Tony Muhammad delivered another version of the first part of his lecture "Defending Farrakhan: Exposing The Lie And The Liars." The second part will be delivered next Sunday, December 9, 2018. 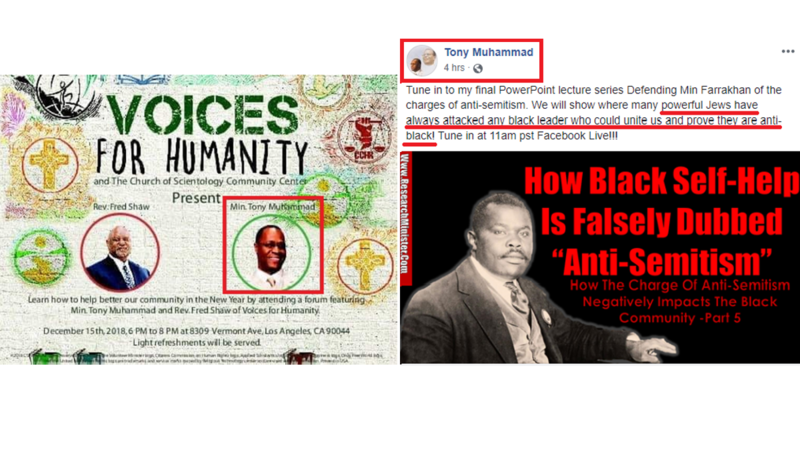 In this first part of his lecture (i.e., both videos linked above) Tony Muhammad attacks Judaism, Jews and White people generally. at approximately 1:07:28, says "I'm going to show you how the Jews plan to make sure that Black people never make no gain in America through jobs." I will be doing tweets about this when I have time to do the screen caps and compose the tweets. I'll add that, at the very least (and unlike Scientology) the Nation of Islam and Minister Tony Muhammad are intellectually honest and forthcoming on this issue. They are upfront about their policy regarding gay people. 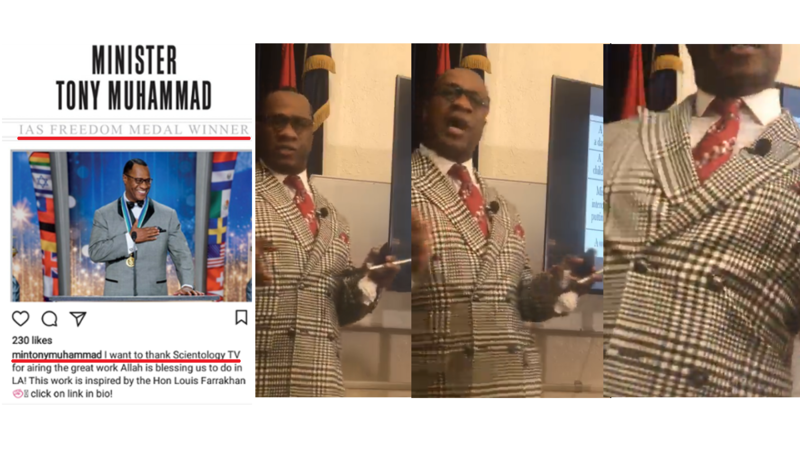 In the linked lecture, Minister Tony Muhammad reiterates the NOI policy of, "You can come as you are. You cannot stay as you are." That is, the NOI will accept gay people, which his lecture indicates were victims of abuse, but they cannot remain gay. He also indicates the NOI will help them to stop being gay. 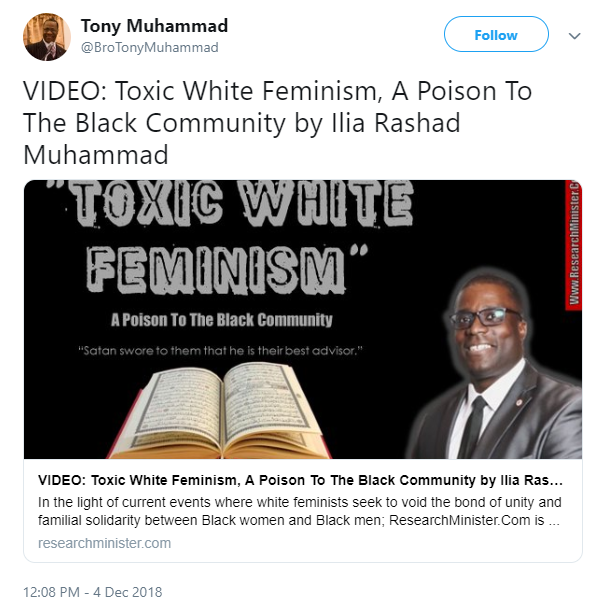 2017 Scientology Freedom Medal Winner Nation of Islam Minister Tony Muhammad is promoting the video "Toxic White Feminism, A Poison To The Black Community," by Ilia Rashad Muhammad. 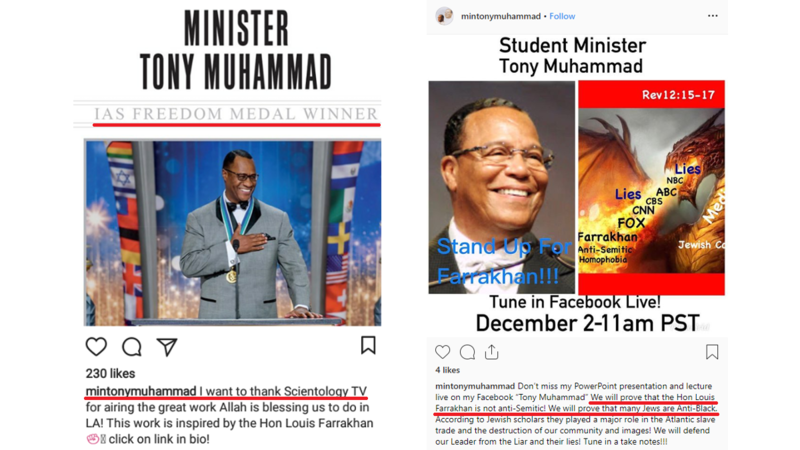 Tony Oretega has a major story today about Scientology Freedom Medal Winner Nation of Islam Minister Tony Muhammad, the Church of Scientology and David Miscavige. YouTube has flagged the video and disabled features because the "content has been identified by the YouTube community as inappropriate or offensive to some audiences:"
YouTube confuses news reporting exposing bigotry and anti-Semitism with bigotry and anti-Semitism themselves. As a result, YouTube censors such news reporting and allows bigotry and anti-Semitism to flourish and prosper with less effective challenge. 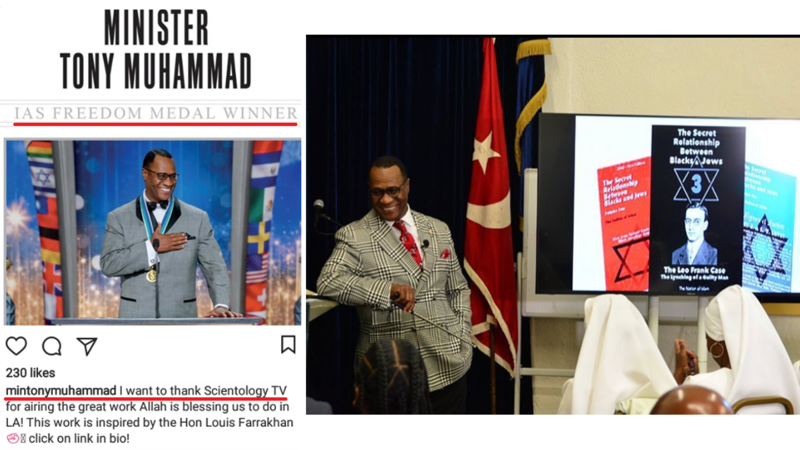 Today, Scientology Freedom Medal Winner Nation of Islam Minister Tony Muhammad delivered Part 5 of his lecture series defending Minister Louis Farrakhan, "The Lie & The Liars." Tony Muhammad states: "We will show you the role many Jews played and still to this day play in our destruction!!" Please note the references to the ADL, the SPLC, AIPAC and the Talmud in the lower right had corner of the poster. Also note the three book series "The Secret Relationship Between Blacks and Jews" is centrally featured. 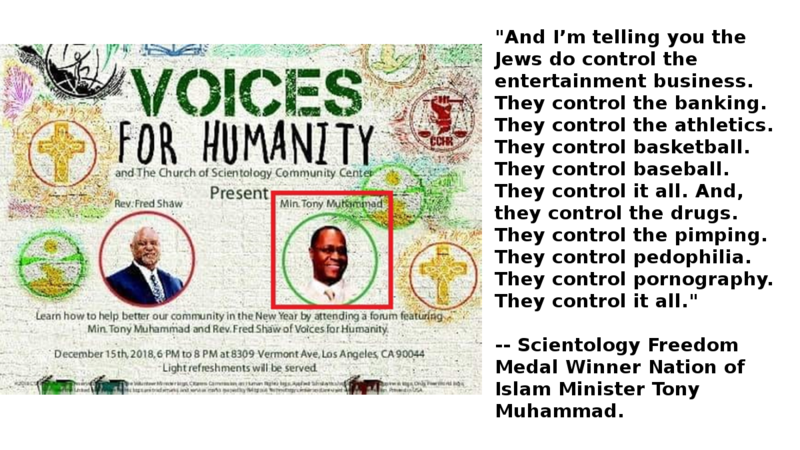 At 51:23 of his recent video defending Farrakhan, Scientology Freedom Medal Winner Nation of Islam Minister Tony Muhammad says, "There are some good Jews." He again distinguishes between the Jews who follow only the Torah, and Jews who follow the Talmud. Tony Muhanmad says, "The Talmud is a book that is full of tricknology. These are the people of Yakub." 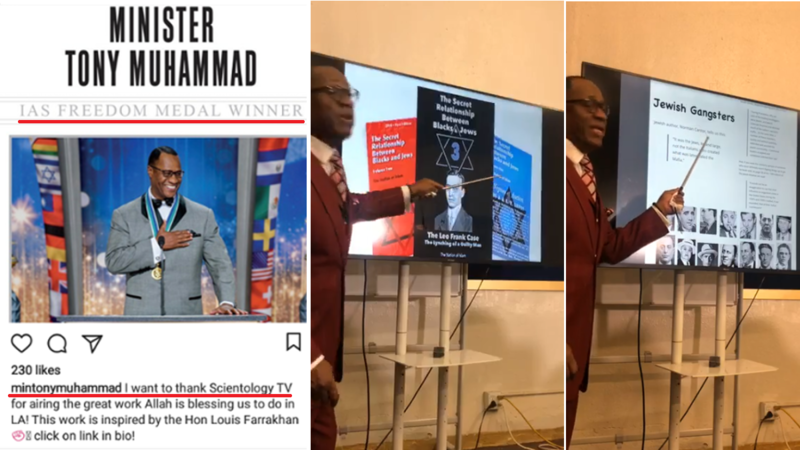 In his recent video defending Farrakhan, Scientology Freedom Medal Winner Nation of Islam Minister Tony Muhammad teaches from the three book series "The Secret Relationship Between Blacks And Jews" (at 1:45:16) and also teaches about "Jewish Gangsters" (at 2:07:10). W/o knowing all that much Jew the Talmud appears to be a history of the Jews and since the NOI is co-opting as the "original Jews" and today's Jews are the "so called Jews" it makes perfect sense to hate the actual recorded history. As for the Jews genetics don't lie. See Tony Ortega's story: "Scientology is quick to cry ‘bigotry,’ but these photos prove David Miscavige’s hypocrisy." And your point here? Regardless of genetics, people are (should be) free to observe their religion whether there's a genetic connection or someone has converted and has no genetic connection, no? The point is, if you've been following Rizza Islam and the NOI conspiracies freak show, is that they consider Jews to be the "so called" Jews and not real Jews. Their position is that Judaism has been stolen from the "original man", who is black, by whites. The DNA refutes that and says otherwise. Judaism hasn't been co-opted by whites or Europeans and is and is still 100% Jewish and definitively Jewish. Jews today are the original Jews and always have been. The only people co-opting Judaism is Rizza Islam and his conspiracy crew. Yes...of course if someone converts and becomes a Jew who cares their DNA? What's going on is the lie of cultural appropriation by the NOI. It happens in amongst the Indians of the U.S., too, where tribes claim traditional headdresses that were never their tribal traditions. Case in point is the Lakota tribes and the traditional eagle feather war bonnets. That was theirs and no others but I've seen many non Lakotas lecturing and lambasting whites over this point when they are, factually, the guilty party of cultural appropriation because their tribe isn't Lakota and never has been. The Jewish population has a distinct genetic history that isn't and never was black...no matter how many black Jewish converts that are or have been. 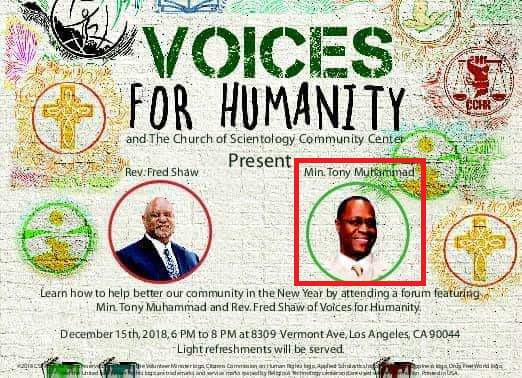 12/15/18: As a "Voice of Humanity" at the Los Angeles Church of Scientology Community Center. 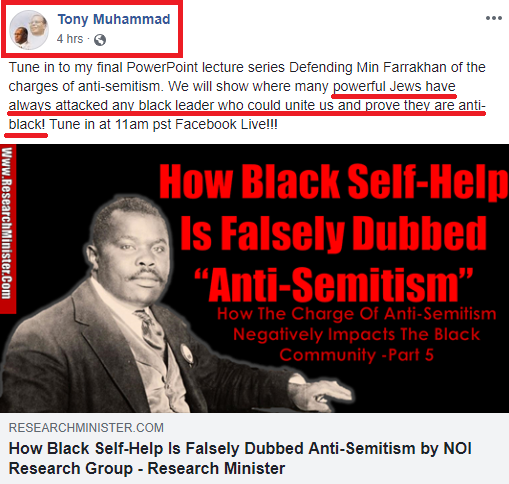 12/16/18: Via Facebook Live on how "powerful Jews have always attacked any black leader who could unite us and prove they are anti-black!" Fred had his own group home at the time. The got L Ron an NAACP award... heh! 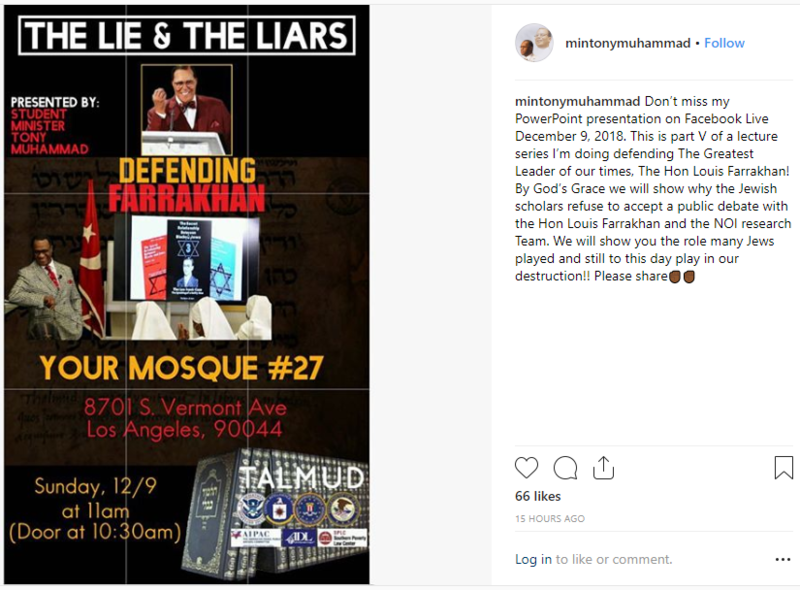 Fred has been involved with a few other ventures with Alfreddie and Hanan Islam over the past 2 decades..
3 Scientologists Alfreddie Fred Jr and Tony Muhammad speaking and Scientology claiming this Is an Interfaith Gathering... what a hootenanny! heh! Fred runs the CCHR exhibit in LA and with Rizza Islam. If Tony has only made it up to Student Minister, how much longer does it take to become a full Minister in the NOI? 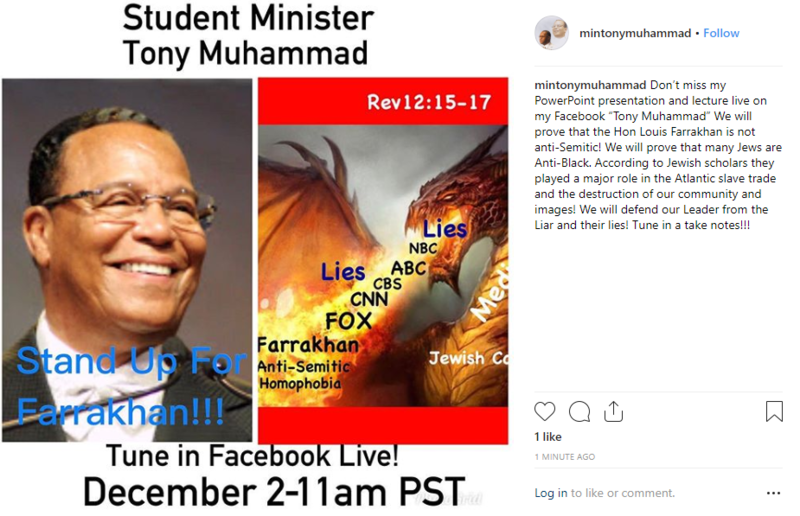 The "Student Minister" label is unique to the Nation of Islam and misleading to outsiders. The only non-student minister in the Nation of Islam is Minister Louis Farrakhan. ALL other ministers in the Nation of Islam are "Student Ministers" because they are students of Minister Farrakhan. In other words, there is only one non-student minister at a time; all others are "student ministers." 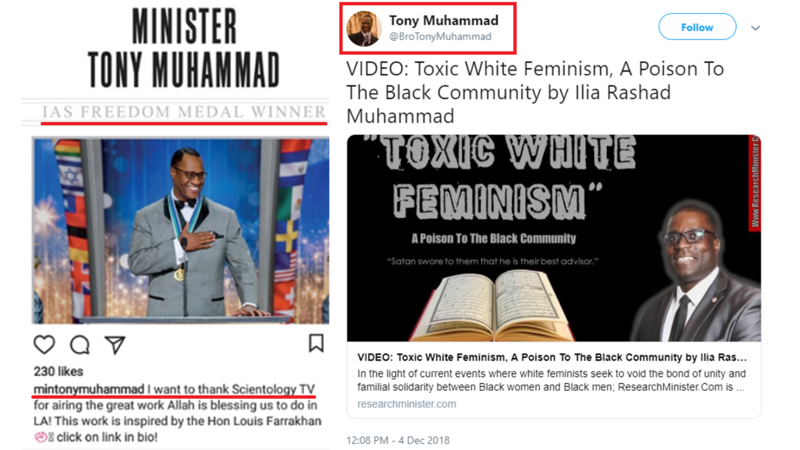 Although Tony Muhammad is the "Student Western Regional Minister of the Honorable Minister Louis Farrakhan and the Nation of the Islam" there is no one higher than him in the Western Region. That is true of the other "Student Ministers" with respect to their regions. Got it! Thanks for the explanation. I should have read farther back into the history of the thread to get the full context. Of course NOI is a conspiracy freak show. No wonder they've paired with the CoS. No good will come of it in the end. I've got my popcorn and am waiting for the fireworks at the end of the show. In the December 11 episode of A&E’s hit documentary series "Leah Remini: Scientology and the Aftermath," former Scientologists Remini and co-host Mike Rinder discuss the unusual relationship between the Church of Scientology and the Nation of Islam (NoI). At the beginning of the episode, a statement from the Church of Scientology is displayed on screen, which accuses Remini of "spreading bigotry that instigates violence," and compares the show’s "lies" and "discrimination" to 1930s Germany. This isn’t unusual. The Church of Scientology is notoriously litigious, and during most episodes, Remini’s show features disclaimers from the organization. After detailing the origin of the Nation of Islam, the episode charts the political and religious organization’s recent affiliation with the Church of Scientology, which Remini allegedly helped to facilitate prior to defecting in 2013. I was approached by Scientology to bridge the gap between [the organization] and the black community. And I wanted to do that. I had no idea what the Nation of Islam was. Again, I don't want to excuse myself because I should have done my due diligence, but I honestly was a Scientologist, and we were not questioning what our church was asking us to do.